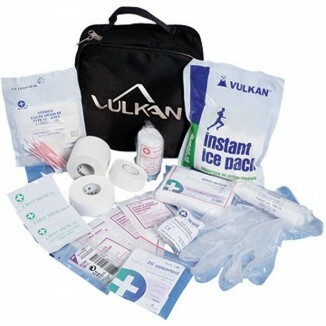 Ideal for any emergency, these packs are activated by simply squeezing them. They instantly turn ice cold. .. Bottles and carrier An ideal accompaniment to Vulkan Kit Bags. .. Bag with content Kit B Professional and stylish, this extremely versatile, washproof medical bag will help you keep your medical supplies organised. Size 39×25×24cm. Kit B contents: 1 Crepe Bandage 7.5cm×4.5cm1 Zinc Oxide Tape 2.5cm×10cm, 10 x Waterproof Dressings, 2 x Sterile Dressing: 12cm×12cm, 1 x Finger Dressing, 4 x Big Plasters: 10cm×9cm, 5 x Double Sided Non-Adherent Dressing: 5cm×5cm, 6 x Wound Cleansing Wipes (Alcohol Free), 2 x Vulkan Ice Pack, 2 x Vinyl Gloves: Powder Free (Medium), 10 x Cotton Buds, 1 x Swabs Sterlie: 10cm×10c..